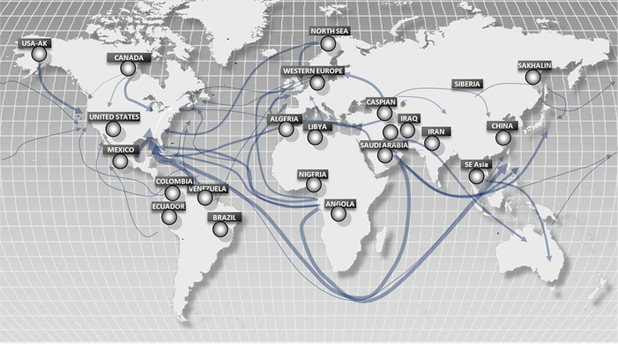 EAI, Inc.’s coverage of crude oil is marked by in-depth information, analysis, and insight for all segments of the crude trade from production and logistics, to refining and economics. We track world crude production and pricing from a top-level perspective down to the production basin level. EAI, Inc. has extensive experience in evaluating the integrated crude oil supply, distribution and refining business structure. By conducting its analysis at the resource and asset level of detail, while recognizing macro trends and events, EAI, Inc. can provide a range of knowledge applicable to specific operations, assets and resources. EAI, Inc. offers a comprehensive array of products and services as parts of its crude product and consulting business that are integrated with EAI, Inc.s Downstream and Market consulting and product business areas. 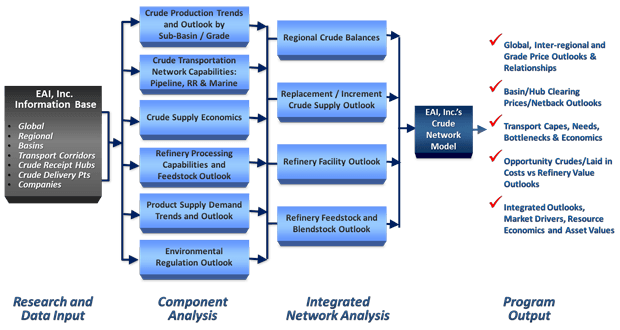 EAI, Inc.’s unique and leading edge bottom-up data bases, analytics and value building processes have also been applied to the condensate, NGL and natural gas business areas. EAI, Inc.’s Special Topic/Industry Study consulting area includes studies that are issued on a regular basis by EAI, Inc. with inclusion of some data/topic specific client customization. These products include regional refined product business studies, regional crude oil supply-demand-logistics-pricing studies and special topic studies focused on specific commodities (condensate, distillate, jet fuel, gasoline, etc. ), business components (logistics, refining, resource development, etc) or new trends/events (fuel oil sulfur specifications, West Coast carbon emission regulations, etc.). EAI, Inc. has been marketing these types of studies since 1984. These products and supporting analytics tools/models and information bases are a major part of EAI, Inc.’s in-house petroleum business knowledgebase.